The celebration of the festival of light, Diwali continues, and this time it is brighter and trendier than ever. Nail Spa by Gurpreet in association with “Beauness By Arpita”, extended the Diwali celebration with Customer Appreciation Day on November 10, 2018 at their new location Good Earth City Centre. 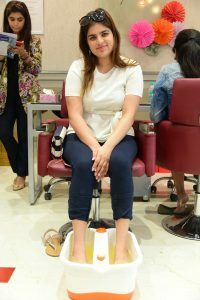 Nail Spa by Gurpreet, started in 2004 by Gurpreet Seble, organized the Customer Appreciation Day and offered an array of pampering session to its clients. People were seen flaunting the trending manicures and nail art done by the artists. The celebration continued with gift hampers and also included an exclusive, complimentary pampering session for hands and feet. The nail artists displayed new designs like wire nail art, galaxy mylar, mirror effect nail art, and the sunglass effect on nails that has become a trend for beauty lovers. 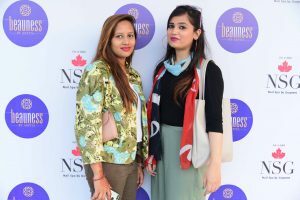 The clients adorned nails with different hues were spotted relishing on the refreshments and were also posing for the photo wall. Gurpreet Seble is the founder of Nail Spa by Gurpreet and also a renowned International Educator and Nail Expert from North America. She has introduced the Artificial Nail Industry to educate, skill and employ local youth. In today’s date, Nail Spa by Gurpreet has 6 outlets across New Delhi, Gurgaon, Pune & Mumbai. 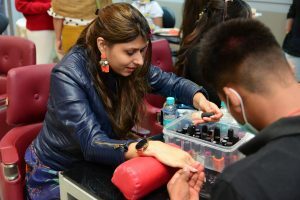 Her four academies are spread across Delhi, Kolkata, Mumbai, Pune that offer Nail Technician courses, Advance courses & Nail Trainer courses as per International standards. Gurpreet has written the National Standards for Nail Education in India under Beauty & Wellness Sector Skill Council (NSDC & Ministry of Skill Development & Entrepreneurship). The only Nail Institute in India to offer VTCT (UK) certification in Nails. Nail Spa by Gurpreet (NSG) specializes in Nail bar setups pan India by providing Training, Products, Trained Technicians, PR material. A small investment can get big returns. NSG is a leader in Nail Innovation with new product launches all the time, such as Holographic, Mirror Chrome, Laser Chrome, Ice Mylars, Mirror Gel Polishes and much more. TheInspireSpy is a way to become your own boss through the power of internet. It is a tool which can empower you beyond anything on the planet.A part of a movement to free every human from the daily job.A great place for those who is passionate about discovering themselves through writing and a platform for sharing favorite things and knowledge with the world.